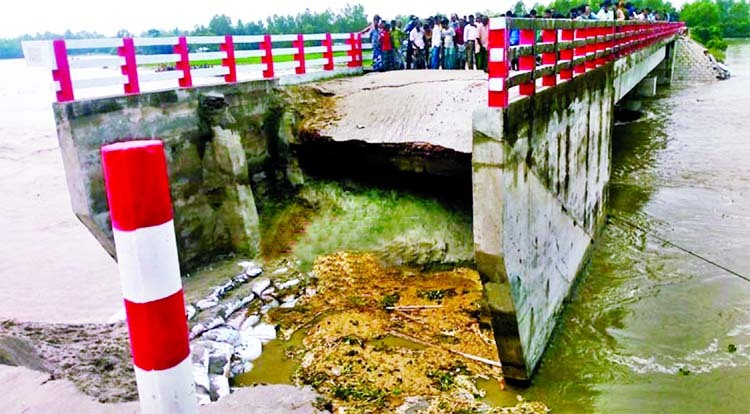 The approach road of the second Teesta Bridge in Lalmonirhat district washed away in the early hours of Friday, two days before its inauguration, due to heavy current. As a result, road communications between Rangpur city and four upazilas of Lalmonirhat have become disconnected. The 60-feet approach road of the bridge was scheduled to inaugurate on Friday (September 16). But at 3:30am on Friday it collapsed in the main area of the bridge near Ichali area. As a result, people of the four upazilas have lost contact with Rangpur divisional city. The locals, expressing their anger, alleged that due to massive irregularities and use of low-level materials, the approach has broken down ahead of its inauguration. Lalmonirhat LGED Executive Engineer SM Zakiur Rahman said that this situation happened as the Teesta has changed its course. It is now flowing north of the main bridge. If the road to the west of the main bridge is not built, it would be difficult to protect the connecting road as well the bridge.